This shelter is in northern West Virginia apporx 50 miles south of Pittsburgh on the map. This dog isn't listed on the shelters pet finder site as he's limited to being adopted by an experienced GSD home or rescue so they said call for information on him. . He will need to be neutered upon adoption. The shelter estimated him to be around 1 1/2 yrs of age. He's obviously in need of some good care and whoever owned him isn't interested in getting him back. This is a very good dog that is clearly a pure bred GSD from working lines from what I can see. The pup has a whte spot on his chest and on the tip of his toes on the front feet but that is likely the white spotting gene at play and not a mixed breed. Looking at how he moves and is constantly in motion I would say he is from working lines and pure bred .. where he came from is unknown but I suspect he either escaped his owners or was abandoned because he was not a good house dog. A lot of people think they want a high drive dog but when faced with reality actually don't. The dog is 462 miles from me one way but somebody close should give thisd og a look. The video could be fooling me but I think the dog is pure bred GSD working line .. he reminds me of some of JoanRo's dogs even. Looks happy and social in video. Hopefully someone will give this guy a home. Looks to me *maybe* GSD/Mal cross. I see nothing other than GSD in this dog .. the head and ears are GSD and the feet or tail show no Mal. The only thing that makes me think in the least the dog could not be 100% gsd is the small white blaze and toe tips but that runs in the GSD and is caused by a spotting gene and/or stress on the mother dog during gestation. He looks like a good dog for someone, seems a little hyper so probably an active home would be good for him. A young GSD that held up for one month in a pound setting is a good dog. A lot of frustration and stimulation to cope with, while confined. He now acts stressed but still is in touch with the handler, checking in with her. Looks like a good dog. Is it known whether the shelter contacted the GSD rescue organizations in the area? Some GSD rescue organizations also have a working dog program. Yes, he's a pb GSD and most likely working lines. The rescues generally require an assessment of temperament and dog friendliness before they will consider. The shelter is 250+miles from where I live so I am not of any assistance so surely someone in that area can help.. Often people get these dogs and once they go missing they never look for them as they don't want them back. 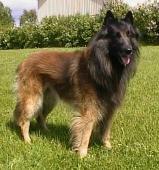 But he is available for private adoption also to a GSD savy person who enjoys a high energy/high drive dog. JoanRo .. my thought as well .. is there a microchip or tattoo .. too good a dog not to have one or both. Could be a freakish good mix and not pure bred but I doubt it. I would love to see his eyes, mouth, teeth, ears and tongue much closer. The shelter people seldom look for a tattoo and reading them is an art form unless trained or used to seeing dogs with a tattoo. If he has a tattoo he is purebred for sure. I doubt the dog is more than a year old .. and possibly 9-12 months of age .. I think the estimate of the dog being 1 1/2 years old is based on size by the shelter people. I think if he was 18 months old he would not be so nice and social with everyone and might be showing some aggression if pressured too much. The dog's behavior reminds me more of a big puppy of 9-14 months maximum age. A lot of dog's in the 9-14 months age bracket have not been around enough older dogs of their kind to copy the older dogs behaviors so they stay puppy like longer. If the dog was indeed 18 months old he would be eyeballing the people in the room more.